You could not ask for a more picturesque or stunning venue for your wedding than the beautiful island of Bali. With an infinite supply of gorgeous, scenic, and intimate settings all over the island, it really is hard to imagine a more perfect place to celebrate your special day. Whether there is just the couple alone, or a huge group of friends and family travelling, a package can be tailored to suit your every need. There are a variety of ceremonies that can be accommodated, including fully legal weddings, commitment ceremonies, Balinese blessing ceremonies, and religious only ceremonies. Though many companies organise weddings, we choose to utilise Bali Weddings International. 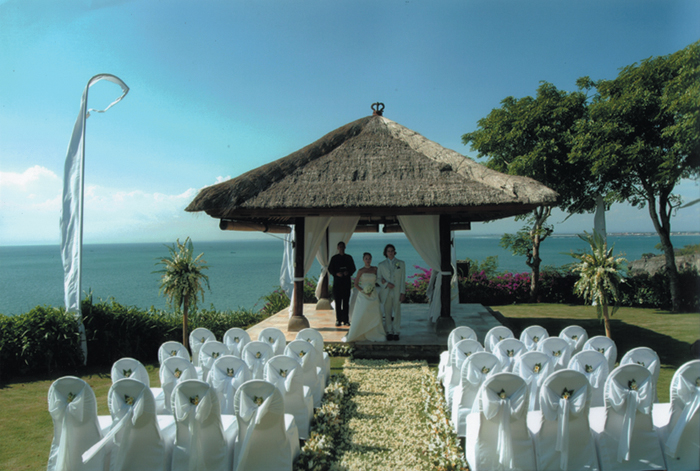 This company was established over 20 years ago specifically to assist foreign couples who choose to be married in Bali. The team of Western and English speaking, highly trained Indonesian consultants, can be relied upon to ensure perfect preparation and co-ordination in every aspect of your wedding arrangements. The services provided include all documentation, liaison with Government, Consular and Religious officials, co-ordination of the wedding location, and even the overseeing of menus and guest lists. In addition to the ceremonies themselves, wedding outfits can be arranged, either Western style or local Balinese, as can professional photography, hair and makeup, flower presentations, and even flower girls and pageboys.